Welcome to the world’s leading destination for professional, real time Caribbean Stud Poker. Play against the house without the need to wear your poker face and in the comfort of your own home. This online game is perfect for your Desktop of iPad. Don’t hesitate to go all in with this Caribbean classic. Similar to other 5 stud games, Caribbean stud is played against the house rather than other players. Stake today to win your fortune at the casino table. NetEnt always strives for innovative and flexible digital casino solutions and delivers high-quality products with unique game design choices. The company was founded 20 years ago. Today NetEnt is one of the market leaders and serves over a hundred of the most prominent casinos worldwide. The energetic development team designs immersive and revolutionary gameplay experiences and have won several awards for their games. NetEnt has a lot of different themed games to offer that will keep a wide range of audience entertained. Caribbean Stud Pro is one of the simpler forms of poker which is only played against the dealer so there will be no bluffing. There is also no draw or community cards in this game which makes it a very straight forward process. When you start the game you are presented with an elegant poker table that is nicely lit by some sort of lamp that seems to be hanging above it, but which is out of sight of the screen. The table is framed by nicely polished wood which adds a luxurious extra to the game. In front of you you have the Ante and Call circle your cards and the Jackpot circle. On top of the screen are the dealers cards faced down, a shuffled deck of cards and the dealer's poker chips. To start the round you will have to place your bet inside the Ante circle. If you want to participate in the progressive jackpot you will have to place an additional 1 pound poker chip in the Jackpot circle. Once the bet is placed you will be dealt your hand. The dealer will also receive his hand which lays face down on the table. Next you can either decide to call, which will double your bet, or fold. If you call the hands are compared and the winner decided. The dealer automatically loses if he has no King nor Ace in his hand. If the dealer does not qualify this way you will be awarded 2/1 on the ante and the remaining bet will be returned. The dealer wins if his cards contain a King/Ace and has a stronger hand. If a draw occurs the stake will be returned to the player. The playing controls are very simple and can all be found at the bottom row of the screen. To play a hand yourself you will have to place a minimum bet of 1 pound or, if you consider yourself somewhat of a high roller, up to a 100 pounds. 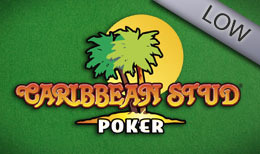 Caribbean Stud Pro is a simple variant of the poker game. It is easily understood and the simple playing controls will emerge you quickly into the flow of the game. The art-style looks very polished and will provide a casino experience inside the comfort of your own home. Caribbean Stud pro provides a great gameplay experience and is the perfect fit if you are looking for an online solo card game.